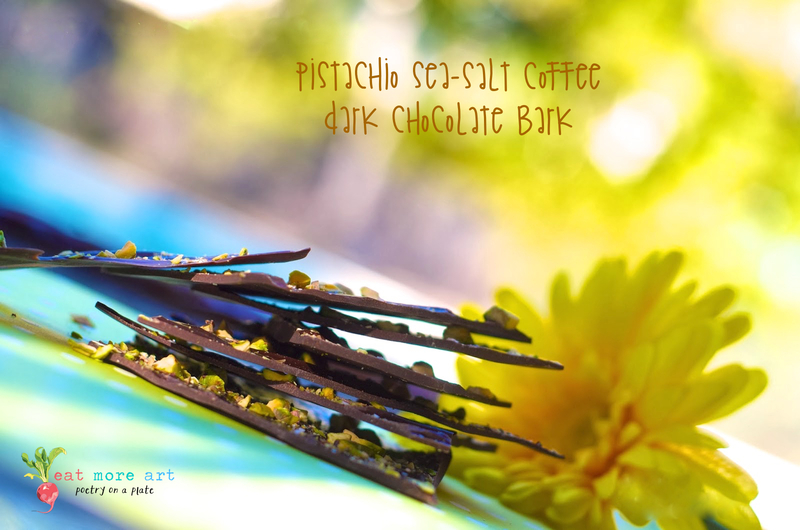 Pistachio Sea-salt Coffee Dark Chocolate Bark is one of the easiest and well loved recipes across the world. Making chocolate bark is a delicate process, with tempering chocolate at right temperatures, in right time etc., but it also is one of the easiest recipes that is sure to win the hearts of your friends and family. Makes for an awesome edible gift this holiday season. Very easy to make, and yummy to the core! Update: This recipe of mine holds the humble honor of winning renowned Chef Sanjeev Kapoor’s ‘recipe of the month’ award in 2014. Prepare by setting a large piece of parchment paper on counter top. Roughly around 2 feet * 1 feet. Heat chocolate over double boiler, Once it's half melted, add the vanilla extract, instant coffee, and a tablespoon of chopped pistachios (optional) to it. Stir. Remove from heat before the chocolate is completely melted. There is also another method to temper the chocolate where you melt 3/4 of the chocolate, once it is completely melted, take it off the heat and add the remaining 1/4 of the chocolate and mix well until all chocolate is melted. 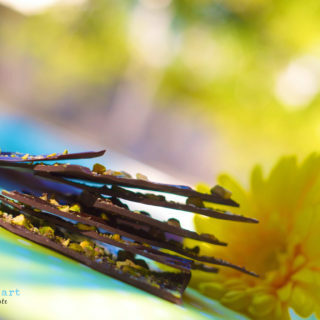 Stir/whisk the chocolate well with a spatula. This gives a wonderful glaze to the chocolate. Pour the chocolate on the parchment paper and spread it think using a spatula. This needs to be done sooner, while the chocolate is warm. Make a very thin layer. In case the chocolate gets bit dry as it gets cold, you can return it back to the double boiler and re-heat it. 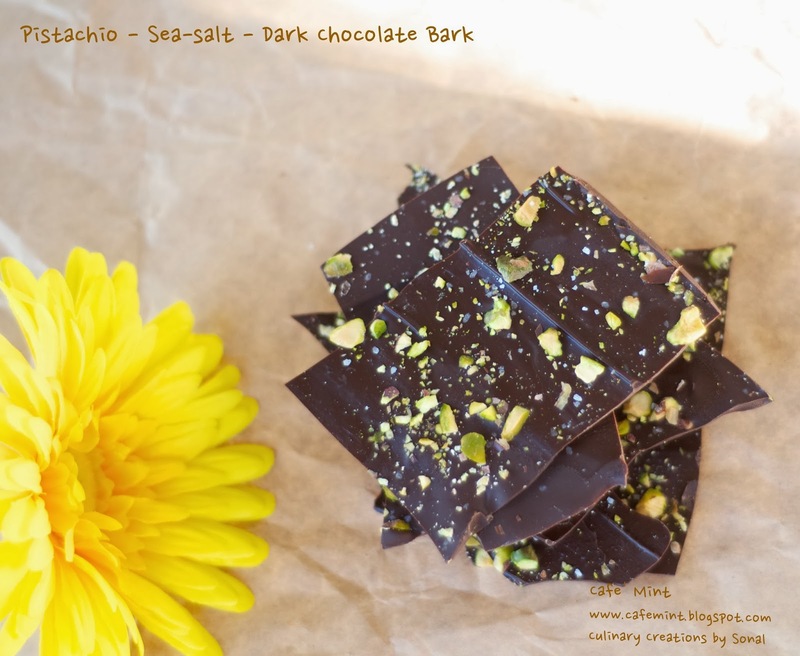 Sprinkle the sea-salt and remaining chopped pistachios on the chocolate bark before it gets cooler. Refrigerate for half an hour to an hour. Break into pieces with hand - the pieces doesn't need to be symmetrical. Can use any kind of good quality chocolate. Need not be just dark chocolate. Be extra careful to make sure not even a drop of water gets added to the chocolate while melting. If it does, the chocolate with seize and will not be usable for this recipe as it will form lumps. When a chocolate is perfectly tempered, it will have a nice glaze and when made into bark, this bark will be nice and firm and will break with a snap. Here are some of the ideas where I made this as well as some of the other recipes into edible gifts.